We left the Marina at 5AM. The drive is mostly 4-lane tollways except for the first 2 hours which is a local 2 lane road with truck traffic and lights. The early departure allowed us to beat the morning traffic mess. On the drive down, our plans changes tremendously. Instead of doing all the errands the following day, we had made good time and decided to press on and get Singapore done that very same day. 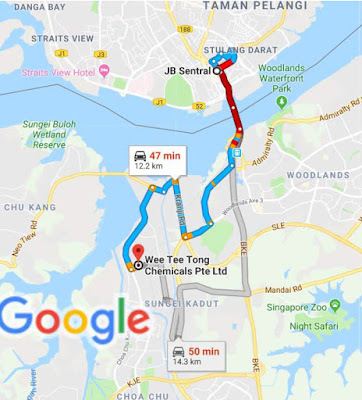 The most common way for cruisers to go the Singapore is to take the bus or car to the JB Sentral Checkpoint, clear out and take the bus across the causeway to clear in at the Woodlands Checkpoint. 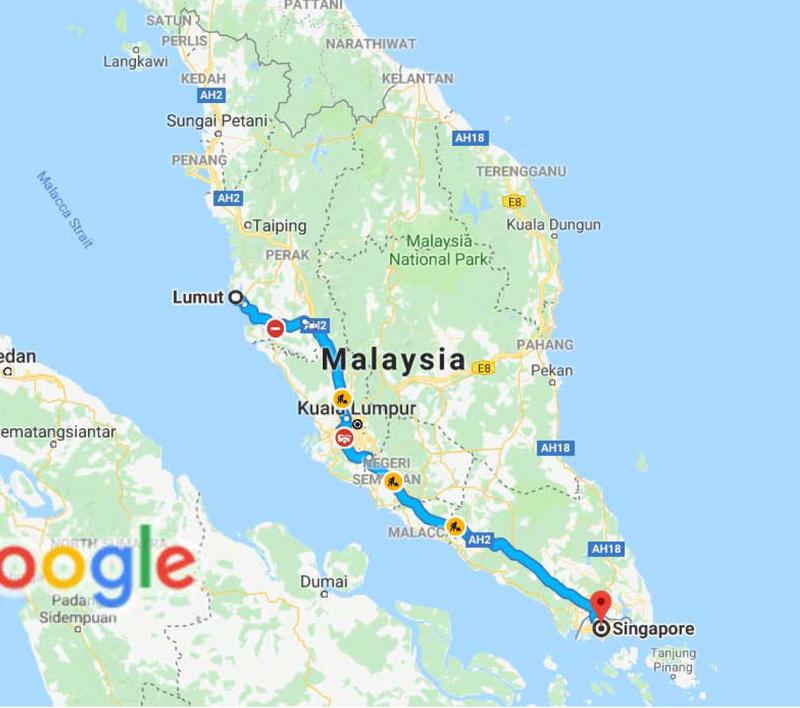 We were going to do that but came up with a different plan on the ride down and decided to try to drive all the way into Singapore. We had heard it was not going to be easy. Clearing out with the car at JB Sentral was easy. Stamped and Go. We then crossed the causeway to Woodlands and things got interesting. Car documents, insurance, registration, and passports had to be verified. Similar to if you were going to import a vehicle. After all, how do they not know you aren't going to sell it while you are there and never pay import duty. A temporary permit had to be purchased, and lastly, a toll pass had to be linked to our license plate to allow us to pay the bridge toll. We stopped at the bus terminal to top up the toll pass and exchange US dollars for Singapore dollars. We made it to Wee Tee Tong Chemicals before they closed and picked up their last remaining 6 gallons of Duratec. We fought the afternoon traffic also heading to Malaysia, got back to Woodlands, cleared out, and drove back across the bridge. At this point it got interesting. Customs searched the trunk and wanted to know about the ‘paint’. I showed them the invoice and boat papers which allow us to bring boat repair materials into Malaysia free of duty. The inspector wasn’t sure of the “Yacht in Transit” tax exemption and didn't understand the high cost of the ‘paint’ ($1000 Singapore dollars). He had to call his boss who was incredibly nice. He said “…you absolutely have the right to bring boat parts into Malaysia free of duty…. just have the documents ready next time you come through here…”. Of course I had the documents ready on this crossing, but they feel they always have to say something. I thanked him, shook his hand, and off we went to Immigration. Immigration seemed to take forever and we caused quite the traffic backup. There aren't that many foreigners driving across the boarder apparently. Malaysians just get the 'wave through'. This is where it all comes down however. We gave them all 4 passports. Then each one of us was called out of the car to have our fingerprints scanned. We saw a bunch of stamping happening. Malaysians love stamping things. Our passports were returned, and off we went. It wasn’t even 5PM. Wow, what a day. The four of us headed off to the hotel for a drink. Oh yeah, 3 of us got 90 day visas. Booker only got until the ‘investigational’ visa that she just received in Ipoh the day prior was set to expire. 79 days.